well here is a quick postcard from the edge of civilization. Following on from a trip to Sydney, stopped off in Bangkok for a couple of days. 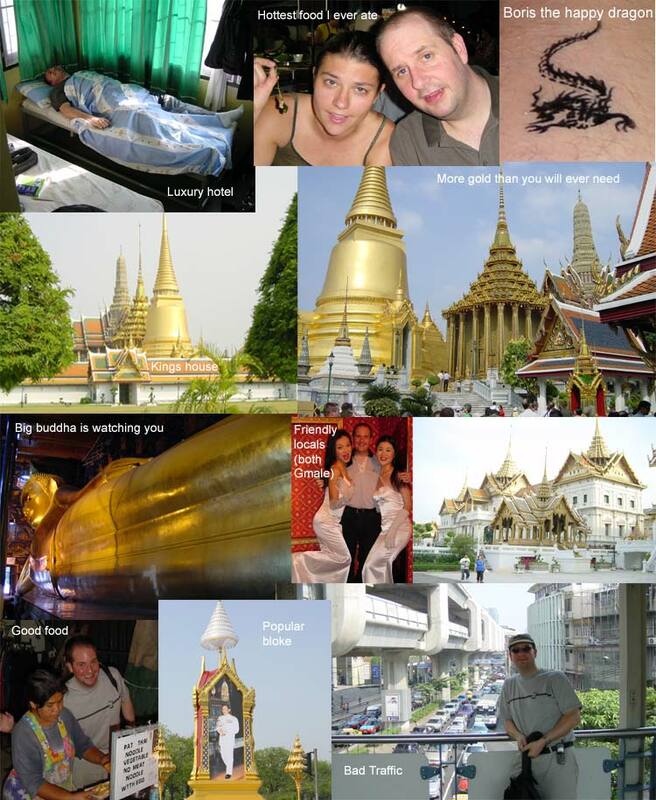 Arriving in Bangkok at 2 am, we took a taxi to Khao San Road – the backpackers centre my guide suggested. We found a “luxury room ($5)” in hotel at about 3 am. The hotel was in a street, which even at that time, was bustling with life – most of it human. Sunrise (an hour later) revealed the most amazing city – sights, smells and smog like you would not believe. First and most importantly, shopping. The first stop – the tattoo and fake id shop was the first stop – one henna happy dragon tattoo (now christened Boris), student ID card and a international press ID card later we were off clothes shopping. This resulted in 5 new Calvin Klein shirts for £3 each and after a hot day shopping, what better way to wind down with a Thai massage – “with herbs”. That meant after the massage you were doused with a hot, bright yellow sponge soaked in stinky herbs. We emerged from the temple looking like large, although rather relaxed, lemons. Day 2 was culture, temples, temples, temples, boat trips and then more shopping.. this time music, software and DVDs including the new Harry Potter film. DVDs were expensive though at $5 each?! Having seen all the culture we needed for weeks, and drunk and ate late in to the night. The food was excellent, spicy like you would not believe, but a highlight was a yogurt drink to cool off the mouth. Take care and if you don’t want to receive this type of crap, just let me know. PS: Update those excellent Calvin Klein shirts after washing will now fit Barbie’s best friend Ken. Stick to pirate software and DVDs they don’t shrink.